I give a lot of presentations about exponential technology. Here's a brief video summary (feel free to skip ahead…). The presentation is designed to be a shock-and-awe wake-up call about the nature of exponentially accelerating technology and its implications. In it, I quote a now-infamous figure from Frey and Osborne: 47 to 81% of jobs as we understand them could be under threat from technology within 20 years (acknowledging there are differences of opinion on this). And then I show the crowd a recent headline: Apple's Foxconn factory in China just fired 60,000 people and replaced them with robots. This is a horrible headline, I say. I don't want to diminish what has just happened to these people. At the same time, this is a narrative we in the Western world are familiar with. We've heard it for more than a century: "Factory workers replaced by automation." Not so much the next headline: "Artificially intelligent lawyer, Ross, hired by law firm." Or the following one: "Artificially intelligent chatbot successfully contests 160,000 parking tickets in London and New York." Or the following: "Artificially intelligent teaching assistant helps students online for an entire semester and nobody noticed." The audience mutters. This is the shock-and-awe bit. They begin to wonder whether their own jobs could be impacted. The structure of my presentation is designed for maximum impact on my audiences: largely middle to upper-middle class, white-collar knowledge workers. But the story is so much bigger than that. It's been called the "elephant graph": starting low at the tail on the left, gradually rising up to the top of the elephant's head, sliding down his face and then back up as if he were raising his trunk proudly. 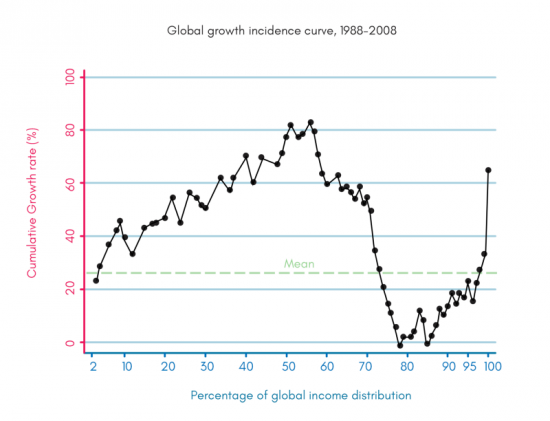 What it's charting is global cumulative real income growth during the 20-year period from 1988 to 2008: how much people's income has gone up or down, at every percentile, around the world. It was created by Branko Milanovic, Visiting Presidential Professor, Graduate Center, City University of New York and Senior Scholar, Luxembourg Income Center, and and Christoph Lakner, an Economist in the Development Research Group (Poverty & Inequality team) at the World Bank. Here's Milanovic's commentary on it. As Milanovic says, there are three points on this chart that are particularly interesting: the tip of the trunk, the high point at the elephant's head, and the dip in between. Let's start with the tip of the trunk. This is the global 1%, and they're doing pretty well. If you were rich to begin with, you've gotten richer - your income's gone up by more than 60% over those two decades. No surprises there. The top of the elephant's head, around the 50-60th percentiles, is also a happy story. Those are the jobs created by the industrialization of China and India, where people went from nothing per day to a little better than nothing per day: a huge increase in percentage terms. It's reflective of good news from other sources: the number of people living in absolute poverty has dropped by more than half over this period, hitting the Millenium Development Goal 5 years ahead of schedule. In May, the COO of the World Bank noted that, "For the first time in history, the number of people living in extreme poverty has fallen below 10%." OK, so better off than they were. But still working for what we in the West would consider slave wages. Let's move on to where the trunk dips. The 75-90th percentiles. Those are basically poor people in rich countries, and they're not looking too good. Sure, if you're on minimum wage in Poughkeepsie you're better off than someone in Bombay pulling in less than 50 bucks a week. But your income is growing much more slowly than the rest of the world. In some cases it's barely holding steady, and in some cases it's actually going down in real terms. In every case it's going down relative to those around you. That this should be the case is also somewhat unsurprising. 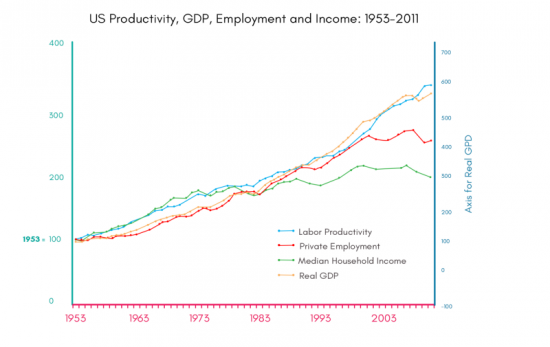 In a piece published in 2012 Andrew McAfee showed that, after more than 30 years of wages and productivity increasing in lockstep, they began to diverge in the early 1980s. By 2011, while productivity and GDP continued to climb - even factoring in the dip from the GFC - median household income and private employment were both on the decrease. So the fact that GDP in the US, for example, went up over the 20-year period in the elephant graph doesn't mean that wages went up, or that workers are better off. They did not, and they are not. This is the hollowing out of the American middle class. This is the shift from labor to capital. And this, I believe, is the source of a significant amount of global discontent: where phenomena like Brexit and Sanders and Trump find fertile ground. But this is also not the only reason we should be concerned. Back to my exponential tech presentations. One of the main points I am there to make is that the thing that is increasing exponentially is the price-performance of technology. The shock-and-awe headlines about the artificially intelligent lawyer et al relate to the performance side of the price-performance equation: machine learning has now gotten so good a robot can do your job, Ms. Knowledge Worker. But the Foxconn headline? The 60,000 workers replaced by robots? That's the price side of the price-performance equation, and it's a lot scarier. Technology has gotten so cheap that it is now more economically viable to buy robots than it is to pay people $5 a day. And technology only gets cheaper over time. So what does that mean for the people at the head of the elephant, the emerging middle class in China and Asia? Last month, Futurism.com reported that, "137 million workers from five Southeast Asian countries are in danger of being replaced by automated systems in the next 20 years. The International Labour Organisation says that laborers working in the manufacturing industry, the garment industry most of all, are at the highest risk." That doesn't even count China. As technological performance gets better, the dip in the elephant's trunk will extend to the right. As the cost of technology plummets, it will extend to the left. It's possible to envision a scenario where only the tip of the trunk - the richest of the rich, growing ever richer - still shoots proudly towards the sky. If the current dip drives unrest in the Western world, what happens when the decoupling of wages and productivity hits the developing world? We have a lot of work to do here. Yes, we have 200 years of headlines saying the robots were going to take our jobs. Yes, historically new technologies have created more jobs than they've done away with. Yes, we have no idea what kind of creativity will be unleashed when 3 billion new minds come online in the next five years. But we have a rocky road ahead. It is not a simple transition to go from assembling iPhones to starting your own micro-enterprise. It is not easy to retrain a truck driver to be a data analyst. We need to be thinking hard, now, about technological unemployment. About the fact that while technology provides benefits to billions, the economic gains tend to be concentrated for a few. About the fact that we made up the idea of a job in the first place. This is not a task for a small group of intellectual elites. This needs to be a collective conversation, from first principles: What should our global socioeconomic system look like? There are no easy answers. But I, for one, am ready to engage with the question. Are you? The SingularityU New Zealand Summit, the first one ever in Australasia, takes place in Christchurch from 14-16 November 2016. It features Singularity University's world-famous faculty, along with thought leaders from the region. You can get tickets here; special pricing is available for entrepreneurs, non-profits, educators and youth.